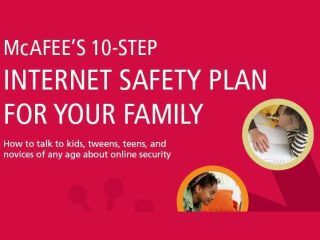 Malware specialist McAfee has launched a handy new ‘10-step Internet Safety Plan eBook’ to educate computer users about the latest threats and potential dangers lurking in the darkest depths of the internet. For more advanced users, the guide may well seem to state the obvious, though for the majority of computer users out there it’s full of genuinely useful and easy-to-understand “safety guidelines for kids, ‘tweens’, teens, and novices”. “The days when people went online only to gather information and send email have changed—the internet is now an indispensable part of our daily lives. Cyberspace is an exciting environment full of opportunity, but it is also increasingly risky, with numerous threats emerging daily. Teens and kids are known to engage in “risky” online behaviour, claims McAfee. According to the firm, a worrying “45 per cent of young people said someone they’ve never met has asked them for personal information online”.